Every language in the world is an amalgamation of many other languages and English is no exception. Today we’re going to learn about such ‘Foreign words and phrases’ that we hear all the time but at times, don’t understand. Well, not anymore. So as a friend of mine would like to say, without further ado, let’s begin. • We had an alfresco lunch yesterday. • Every time I’m worried about the consequences of my actions, I just say to myself, ‘Carpe diem‘ and get on with it. • I heard that Janice is having a tete-a-tete lunch with her secret boyfriend. • How can you trust him with such an important work? You should know that he is a klutz. • Believe it or not but my pet dog is filled with joie de vivre. • When I saw her enter the room, I had a strong feeling of deja vu. • I am desperate to get a job and I have sent my CV to every possible company. • We will have to maintain the status quo till the dispute is settled by the court. • Her outfit on the red carpet was the biggest fashion faux pas of this year. • We all went to the airport to wish him good luck and bon voyage for his new journey. Hopefully, next time you hear these words or phrases in an English conversation, you won’t scratch your head or end up making a language faux pas but would know what they mean. Take a step ahead in learning about foreign languages words used in everyday communication by reading our blog on Commonly Mispronounced Foreign Food Items. 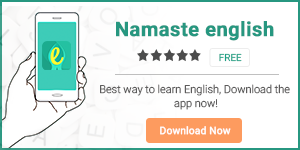 To improve your vocabulary and communication skills, download our apps Namaste English and HinKhoj.